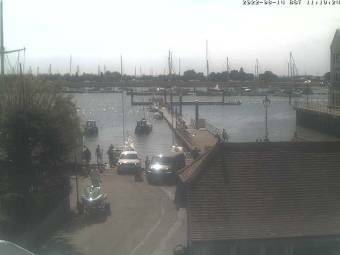 It's 07:48 in Brightlingsea, United Kingdom right now. Harbour View View of the town pontoon in Brightlingsea. Shoeburyness: Shoeburyness East Beach Cam, 21.8 miles away. Bredfield: Bredfield, Woodbridge, UK - Weather, 25.1 miles away. Sheerness: IOS Sailing Club, 28 miles away. Ramsgate: Port of Ramsgate, 37 miles away. Deal: Deal Pier, 43.7 miles away. Deal: Promenade and Pier, 43.7 miles away. AIDAluna: Bow Cameras, 46.6 miles away. AIDAluna: View from the Port Side, 46.6 miles away.